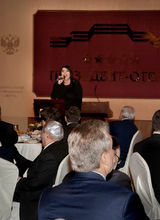 MOSCOW – The 16th annual Russian National Prayer Breakfast (RNPB) took place on March 15, 2016 in the Red Hall of the Hotel Complex “President-Hotel”. 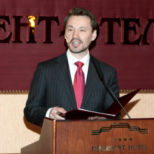 After a prayer of thanksgiving and breakfast Mr. Viacheslav Starikov, master of ceremonies, presented a brief history of the National Prayer Breakfast movement and it’s purpose, as it is expressed in “A Word of Welcome” by Mr. Peter N. Sautov, the Chairman of the National Morning Prayer Foundation, on the main page of the official web-site of the Foundation http://www.fondnum.ru/english. – diplomats of the Albanian, French and Canadian embassies. – representatives of major religions and confessions. Rev. 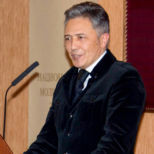 Igor Kovalevski, General secretary of the Conference of Catholic Bishops of Russia, the administrator parish of Saints Peter and Paul Cathedral in Moscow, read the text of the Sermon on the Mount of Jesus Christ from the Gospel of Matthew. In the process of reading, when the text came to the Lord’s Prayer, he invited all present to stand and address God in the words of that prayer. Renata Wołkiewicz, singer, composer, musician, prize-winner of multiple international vocal competitions and a finalist of the Russian voice project “Golos-4”, performed a Russian version of the song “You raise me up”, lyrics by Brendan Graham, music by Rolf Løvland. This song speaks of the comfort and encouragement each person can find in fellowship with the loving heavenly Father. 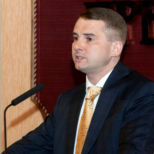 The first thematic address on the subject of the protection of persecuted Christians was presented by Mr. Yaroslav Nilov, State Duma Committee Chairman on Public Associations and Religious Organizations. To underscore the importance of the subject he listed a number of facts of persecution of Christians over the course of world and Russian history, as well as examples of persecutions and privations of the followers of Christ in today’s society. Our gaze must firstly turn to those regions of the world where Christians are victims of persecution. In many countries of the Middle East and North Africa whole families, villages and cities of our brothers and sisters in Christ are being completely exterminated. Their churches are being barbarously ravaged and looted, their sacred objects profaned, their monuments destroyed. It is with pain that we call to mind the situation in Syria, Iraq and other countries of the Middle East, and the massive exodus of Christians from the land in which our faith was first disseminated and in which they have lived since the time of the Apostles, together with other religious communities. We call upon the international community to act urgently in order to prevent the further expulsion of Christians from the Middle East. Our strength is found in unity, but today a lot of effort is directed to the realization of “divide and conquer” principle. Therefore, it is crucially important to have meetings, where representatives of different confessions defend human rights and common ethical values. We must not fear to speak out, to present our viewpoint and to defend our position. “Silence today may turn into great sorrow tomorrow,” concluded Mr. Nilov. 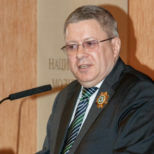 Mr. Alexander Torshin, State-Secretary - Deputy Chairman of the Bank of Russia, gave a second thematic address on the subject of traditional family values. 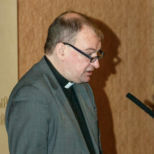 First of all, in characteristic warm manner Mr. Torshin expressed his gratitude to the Foundation “National Morning Prayer”, the organizer of the Russian National Prayer Breakfast, and especially to the Chairman of the Foundation, Mr. Peter Sautov. – the number of abortions is horrifying. 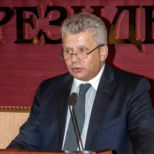 Mr. Anatoly Aksakov, Deputy Chairman of the State Duma Committee on Credit Organizations and Financial Markets, said a word of greeting on behalf of the deputies of the State Duma. He summed up the sermon that Jesus Christ preached on the mount of beatitudes, as a sermon about love and happiness. Every one wants to be happy. A family is a place where one loves and is loved by others. 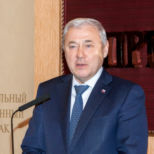 “Family is happiness.” Mr. Aksakov expressed his desire that his children and grandchildren would live in a prosperous country. The sense of responsibility before future generations motivates all upright citizens to work hard for that future today. 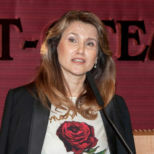 Mrs. Inese Šlesere, Chairperson of the Lavian National Prayer Breakfast, member of the Latvian Parliament (2002-2011), the runner-up in the 1999 Mrs. World and a contestant in Miss World 1991, mother of five children, gave the third thematic address on the subject of traditional family values. Mrs. Šlesere passed greetings on behalf of the Committee of the Latvian National Prayer Breakfast, which celebrated it’s 10th anniversary in 2015. After this Mrs. Šlesere shared a brief history of her life and her political carrier, which was dedicated to the protection and the improvement of the living conditions of orphans in Latvia. “The Kingdom of God – is the best political system.” The values of God’s kingdom find their most natural incarnation inside the family. Therefore, it is essential that God should be at the center of each family. After this Renata Wołkiewicz performed a song that speaks of the reality of struggle, pain and the necessity to be steadfast in this world – “They strike us, we fly”, lyrics by Dzhakhan Pollyeva, music by Andrey Ktitaryev. – (S1) How is it going? – (S2) As well as you pray. – (S1) But I don’t pray! – (S2) Well, that explains it. – the enlightenment of the people through the gospel. In light of the 140th anniversary of the Russian Bible Translation all guests were offered free copies of a Children’s Bible and a Bible with Illustrations by Gustave Doré.